After a chance encounter with a woman at a flea market, photographer Fiona Struengmann was invited to the home of her new acquaintance, an amateur snapshot collector looking to pass on her findings to a new owner. There was only one condition: “Take it all, or leave it all behind.” Moments later, Struengmann was the new keeper of an archive containing 7,000 photographs compiled over the course of 50 years. Looking through the boxes of material, Struengmann was struck by a sense of familiarity and unity with the nameless faces and scenes in each image. While the age of the photographs were made visceral through their physical appearance, the themes depicted in them remained relevant to her somehow. Struengmann was also drawn to their more minute details, with specific objects and forms catching her eye. “These works put me in conversation with the past, held in present time,” she explains. Using a range of different chemical and physical interventions, Struengmann alters the photographs from this massive archive, highlighting the fragments she finds most compelling. Arranging these reformulated images in conversation with one another, she situates them within a new narrative, mapping out our inherent relationship to the past. These tinkerings then become a part of her series called Just Like You, But Different. Drawn to the intricate poeticism of Struengmann’s pieces, I reached out to the artist to discuss photography’s importance in the preservation and legacy of memory, and the role of the “citizen photographer” in contemporary visual culture. LensCulture: Can you tell me the story of how you came to possess all of these photographs? Fiona Struengmann: One morning I was at a flea market going through a box of old letters and images when a woman came up to me and said she might have something for me. She asked for my number. It was a very bizarre interaction, but I was curious. Weeks later, she called me with a time and place to meet her. When I arrived at the destination, I found myself walking through a dark room full of books and boxes with a table in the centre of the room. I sat down and started talking to the woman about her life while she brought out one box after the other, all filled with photographs. She had been trading them for over fifty years in Germany in exchange for signed movie cards, books and money, and was now at a point in her life where she wanted to get rid of them all. She said I could either take all of it or leave it all behind—no cherry-picking allowed. And that’s where this journey began. LC: Why did you title the project Just Like You, But Different? FS: We are all born the same way, and then our individual journeys begin. We all connect objects, gestures and people with different memories in our lives. When I was going through the archive, I felt that I was somehow connected to the people in the images—but on the other hand, I also felt detached as an individual. I would imagine that the way I see the world and the way I feel are different. LC: While the archive you inherited contains around 7000 images, you only work with a select few. How do you choose which photographs to work with, and what draws you to specific images? FS: I think it’s the unconscious similarities that make me feel attached to certain things I am familiar with, even though they are from a completely different context. They draw me in unintentionally and let me tell a story. I am always interested in creating dialogues within an image. Most of the time, I’m interested in things that are happening in the background, like gestures, silhouettes and landscapes—preferably mountains. I grew up in that sort of environment, and I find comfort in it. When I see mountains in images, I am immediately magnetized by them. LC: How exactly do you alter your photographs, and how did you start working with materials in this way? FS: I always loved experimenting with photography’s visual voice, whether I’m building my own camera or experimenting in the darkroom. Photography offers so many different ways to tell a story. For this specific project, it took me quite a while to figure out the right technique and chemicals to use. I would protect the parts I wanted to keep and then—through a chemical process—liquify the other parts of the paper. You only have one chance and can destroy the image within seconds, so it’s quite a challenge for each individual piece. LC: While your photographs do contain recognizable images, there is something additional in your work—tactility, materiality, and the photograph as an object. Can you speak a bit about why these are also important elements in this series? FS: Each photograph has already had its journey as a companion to people, whether it be in a photo album, hung on someone’s wall, or maybe even in a storage box. They come from different time periods that had different aesthetic trends in terms of sizing and shape. 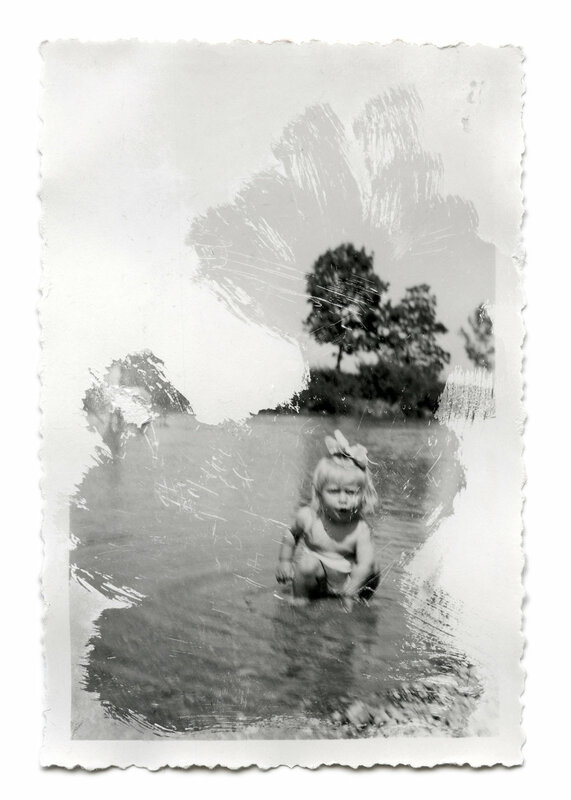 The backs of the photographs occasionally have inscriptions, sometimes including dates and places, which make you have a conversation with them and treat them as individual pieces. Following that, I make other choices, like which brush to use, which colour to choose and how to position the objects within a frame after the alterations have been made. I love the fact that all the pieces communicate with each other, but also have their own voice when standing on their own. LC: How do you reconcile with the act of altering historical objects? Is this something you think about a lot in your work? FS: Yes, I do. I select pieces very carefully, and many images I find, I would never touch. I have been collecting old photographs since I was 14 years old, and with this archive in particular, I first made a selection of images that were never allowed to be altered. They were so perfect in their composition, light, printing technique or historical information. But on the other hand, who am I to judge? I become an editor and make a decision and choice from a collection of images that have otherwise been forgotten. LC: You’ve described your work by saying that your photographs put you “in conversation with the past, held in present time.” This begs the question: what sort of narrative are you structuring with these images? FS: These images come from the first of what we now refer to as “citizen photographers”—the first people to document their surroundings and everyday life using the medium of photography. I am always thinking about where we come from and how fascinating it is to have been born in this specific time period; there have been millions before us and there will be millions after. Even though time has changed and years have passed, we are still drawn to the same subjects that we want to keep in our memory: family, friends, lovers and special occasions like birthdays and vacations. Most of the time, life is not actually every lived experience, but it’s what we keep in our memories; it’s the parts that we remember. Photography plays an integral role in this sentiment. It is not the moment, but the photograph that was taken at a given time that creates the memory. When I work on these pieces, I project my ways of seeing in the now onto the photograph, so that it then becomes a memory within a memory. It’s a moment in time that now echoes with mine, but that will one day fade altogether. LC: How do you see your viewers engaging with your pieces? What do you want them to come away with? FS: We are all citizens of the same planet, so I think the works are an invitation to start a dialogue with our natural surroundings. By neglecting certain parts of the image while giving the viewer more space to highlight other aspects like landscapes, gestures and silhouettes, the viewer can hopefully start a conversation with the images and project their own way of seeing onto them. Photography is a medium we can all relate to intimately and subjectively. And if it’s not the medium, then it’s the people that are like you, but different. Fiona Struengmann. Undecided, 2015. Pointillism on paper, paper record. 59.4cm x 42cm. Courtesy artist & Kunstverein Munich. Fiona Struengmann will be exhibiting new works: two drawings and two photographs in a group exhibition titled 'Jahresgaben 2015'. Kunstverein München presents a diverse selection of work by 70 contemporary artists who live and work in Munich and the surrounding area. The exhibition is open to the public, but the works can be purchased at special prices exclusively by members of Kunstverein München. The Jahresgaben exhibition continues Kunstverein München's connection to the local contemporary art scene and sales support both the Kunstverein and artists. Inside London's first ever international photography fair.